From a garage to one of the largest companies in the world – “Apple,” has come a long way; a very long way in fact. We all sometimes wonder if it was sheer luck or something they’d strained themselves for! As you scroll down this page – you’ll get the answers about the company’s establishment; that you’ve longed for. It all started in 1969 with a fourteen-year-old Steve Jobs meeting a nineteen-year-old Steve Wozniack, neither of them had any idea that the two of them would soon change history. Steve Wozniack was highly fascinated with the idea of a machine made by a human that’d inturn make a homosapien’s work easy. He was quoted saying that a book on PDP (Programmed Data Processor – a minicomputer family from Digital that started with the 18-bit PDP-1 in 1959.) was like a bible to him. People fall in love with people, with musical instruments, with art and with anything that captures one’s eyes and Steve Wozniack fell for the perplexity that parts of early computer held within them. The idea of owning a personal computer seemed impossible to that time of the world but then, the year 1974 saw the advent of ‘Altair 8800,’ a DIY microcomputer kit. Computer classes started popping up all over the US and people started forming computer clubs to discuss what could they do with the Altair 8800. The homebrew club in San Fransisco was the club in which people worked together to understand the mechanism of Altair 8800. Amidst all this, Wozniak started to give a shot to making his personal computer all by himself – luckily, the early CPUs from intel and motorola started to be accessible to the public. Woz took advantage and each time he made a new improvement in his computer, he’d show it out in the homebrew club. Steve Jobs was a part of the homebrew club and told Woz that the two of them must consider selling these things that Woz was making – to the public. “Apple” then saw its official establishment in 1976, Jobs and Woz had set up their store in an old garage and used to work on the improvements of the computer in the same garage. Steve dreamed of selling the first real package for these computers with the help of hardware hobbyists who could assemble the computer themselves and also the people who couldn’t assemble it but wanted to mess around with it, once when assembled; i.e, the programmers. 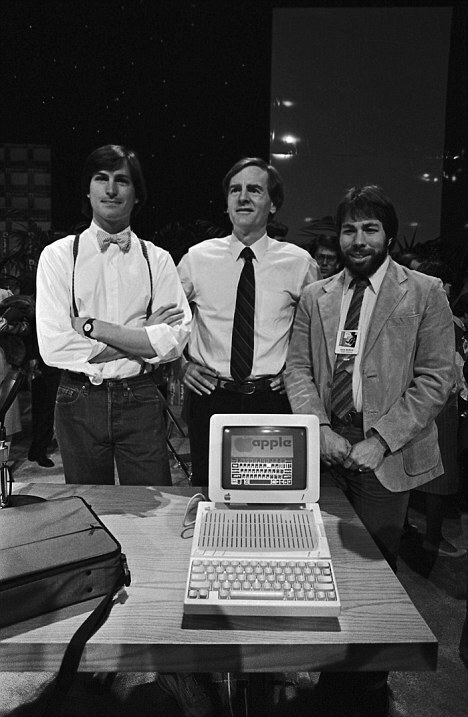 Steve Jobs and Wonziak with each of their skills made up a computer and the way it was put together attracted people towards the product. Apple started to come into the light! Both the Steves’ were worth more than a hundred million dollars in their mid twenties – but it didn’t matter to them as they never did it for the money. IBM and other companies made it difficult for Apple to have a stable foot in the market and soon apple saw success, failure and everything in between! It had its highs and lows ever since then. Apple managed to take home 92% of all the smart-phone profits in the first quarter of 2015. 1) Wozniak thought of the name “Apple” when he was coming back from the airport. Jobs had just returned from a commune called the Apple orchard and both of them couldn’t find anything better to name the company! Though they knew they could’ve had issues with the “Beatles apple records,” they went further with the same name. 2)Apple has three co-founders! Steve Jobs and Steve Wozniak are well known to everyone but Ronald Wayne hadn’t been in the spotlight. He was the one who designed the first apple logo which featured Sir Issac Newton. The logo hadn’t stayed for much time and Wayne left the company selling his shares for just 800 dollars. If he stayed with his ten percent share, it’d be worth over sixty million dollars today! 3)After being thrown out of apple, Jobs considered being a civilian astronaut and wanted to launch a computer company in the Soveit Union. 4)Steve Jobs had an entire team to focus on the packaging and opening of a box! 5)According to Woz, Jobs had never done anything as a hardware engineer neither did he write any software. 6)The iphone project was so secret that the software guys never knew what the hardware was and the hardware guys never knew what the software was! Hardly anyone inside apple knew what the finish product would look like until Steve Jobs launched it. Intelligence applied right, I must say! 7)Steve Jobs actually served as a mentor for the google founders! 8)Steve Jobs was awarded the National Medal of Technology from Ronald Reagan. 9)The Apple store on 5th Avenue in Manhattan (the cube) is said to be one of the most photographed landmarks in the world. 10)Jobs also created a company called Pixar which was later bought by Disney, making him the largest individual shareholder of Disney. 11)The very first Apple logo was designed by Ronald Wayne.The first logo shows Isaac Newton sitting under an apple tree when he discovered gravity by an apple falling on his head; it has a poem all around its border. Apple’s Logo was redesigned in 1977 by Ron Janoff, the only instruction Ron got from Steve Jobs about the logo was, “Don’t make it cute”. Rob then presented two logos to Steve, one with a bite and the other without. Steve went for the one with the bite. According to an urban legend the reason for picking the logo with a bite in the apple was to pay homage to genius computer scientist Alan Turing who committed suicide by taking a bite from a poisoned apple. The designer and the company however denies any such theory. 12)Apple-1 with the tagline ‘Byte into an Apple’ was the first personal computer to be released by Apple which was designed and hand built by Wozniak. It was sold for $666.66. 13)Apple’s first GUI computer was called Apple Lisa which is rumored to be named after Steve Job’s first daughter Lisa Nicole Brennan Jobs. Apple denies these rumors by saying that Lisa stands for Locally Integrated Software Architecture. 14)Did you know that smoking near Apple computers invalidates your warranty – even if you have AppleCare? 15)If you look at the iPhone photographs in Apple adverts the time is always set to 9:41. This is the time Steve Jobs unveiled the iPhone. Let’s get to the serious stuff! Apple’s first quarter revenue in 2015 just from the iPhone was 51.2 billion dollars! That’s greater than Yahoo’s entire cap of 45.5 billion dollars. And, that’s three times more than the google revenue in the third quarter of 2014! Or, twice as much as microsoft’s quarterly revenue. Apple has more than 178 billion dollars – IN CASH. That’s a hefty amount and apple can buy IBM, Ford General Motors, Tesla and still have 41.3 billion dollars left! The company has twice as much as the operating cash as the US treasury! Apple’s 18 billion dollars were the largest quarterly earnings for any company, ever! In terms of revenue, Samsung has generated two times as much as apple and has over four time as the number of employees at apple, but; looking at the company net income – the story flips! Samsung pockets less than half of what Apple does. Although Samsung has its hand over everything, Apple is a much more efficient business! This has been achieved by Apple by only sticking to a handful of products and giving out the best of features in them – nailing their target market in the process. Apple’s success can be attributed to the different taking of technology – a closer look at technology with a mediocre human’s perspective. Apple believes technology is not just to be at all in life but to get out of the way and be more natural! Let’s now discover our passions and get working! !